On the 22nd/23rd of August 2017 was the “Ariba Live” event at the International Convention Centre at Darling Harbour, Sydney. I was lucky enough to get a free pass, on the grounds that I am an SAP Mentor these days. I could not help but thing of the rather bizarre UK comic strip “Bristow” which runs in both UK and Australian newspapers. Bristow was a cartoon character who worked in the “Buying Department” of the huge Chester Perry organisation. That seemed to be a mixture of accounts payable and procurement and he was 15th in line for Chief Buyer. The cartoon started in 1961 and as far as I could tell that was the time period it was set in all the way up until the strip ended in 2012. It could be described as a sort of cartoon version of “The Office” for 1961 poking fun at the way office workers were back then. In my mind that sums up the UK sense of humour – jokes that were hilariously funny in 1961 probably started to seem more bizarre than funny after ten years, let alone fifty years later. As an example even at the end there were jokes about the bowler hats the characters wore, and the pens they used, which of course had to be recharged from inkwells every so often. How can a fifteen year old in 2012 understand a joke about strange things tea ladies did in offices I 1961? Of course they can’t, but that is no reason not to keep going, clearly. It must seem even stranger here in Australia. In any event it occurred to me that if the comic strip had kept pace with actual changes in office technology, whilst say keeping Bristow the same age as the years went by, instead of using a fountain pen he would have to deal with an SAP ERP system and then probably SAP Ariba. Now I have got used to events like TechEd in Las Vegas, it seems strange that on the exhibition floor there are only six exhibitors who are partners, the rest of the space is all SAP booths. More importantly only one exhibitor was giving out pens! I was horrified. Luckily by the end of the conference I had also got an ICC pen as well, a rare SAP pen, and an Ariba pen. In addition I came away with a bag full of T Shirts. You could have a free beer/wine at lunchtime if you were willing to be filmed and say how great your Ariba project turned out. I had never seen that before at any conference, but despite my love of beer, the Ariba project at my company was a failure so I could not partake of this. Just for context, SAP had only just taken over Ariba at that time, there were loads of problems – I was attending this conference to see if they had all been fixed, which they had as it turns out. The first thing I try to do at an SAP event is to take photographs of the dustbins, which is a grand old SAP tradition started by Jim Spath many years back, but here I found a serious lack of dustbins and they were all hidden. Another interesting point, more to do with the ICC than anyone else, was that the only way out of the men’s toilets is to go through the door saying “no exit”. At Toastmasters we are always taught to keep one eye on the clock so I had to say “Tut Tut” when the first keynote did not start on time – it was 09:10 as opposed to 09:00 which does not seem like much, but if the first speech overruns it means all the other speeches will over-run as well, getting worse as the day goes on. Ariba started in 1997, went to the Cloud in 2005. Their primary goal is that their customers spend 100% of spending via the Ariba system. They got approx. 500 new customers last year plus a 47% growth in volume (of transactions I presume) so this is still more of a “start up” company – which explains why the event (Ariba Live) is still relatively small but growing at a fast pace every year. Huge companies cannot grow at 47% a year for obvious reasons. The first guest was the top procurement office at Woolworths, the Australian department store as opposed to the USA or UK or South African department store chain, all of the same name, all different companies. Woolworths (in Australia) was founded by Percy Christmas you will be happy to know. They also own Dan Murphys which is what the UK call an “off licence”, what Australia calls a “bottle shop” and what the USA calls a “liquor store”. My companies office is Brisbane next to Dan Murphys vault where they keep the alcohol and it sealed up tighter than Fort Knox. Ariba are big on Women in Leadership. A lot of the top procurement officers that gave talks during the keynote were indeed women. Ariba host a special lunch regarding this, on both days of the event. The next guest was IBM – they claim they spend everything via Ariba. Alex Atzberger (Aria CEO) and Cameron Art from IBM get a Toastmasters award for never saying “um” or “ah” when they are speaking. Then a lady came out to do a demo of a new intelligent thing coming out Q1 2018 which can extract payment terms or similar from the unstructured text in an existing contract, whilst creating a new one, and put those payment terms into the ERP system as part of the SAP contract being created. It look for similar existing contracts, uses one as a template then makes suggestions as to what needs to be changed. This is all to do with artificial intelligence which was one of the major themes of the event. She said Ariba had 500,000 new suppliers sign up last year. The catalog UI (what the user sees when they are searching for what to buy) is very different than before, before being some years back when I was doing an Ariba project, now it looks a lot better, a lot more Amazon, it looks a million dollars. Accenture – all their 400,000 employees are potential buyers. All their rules are in the IT system e.g. when do you need 3 bids before buying something, what are the preferred suppliers. In a demo the supplier can respond to a request for quotation via email, and then sign up to the Ariba network for a light account, which is free, rather better than the pay to sign up, pay per %age of each transaction that suppliers used to suffer. My company used to pay the sign-up fee for our small suppliers, otherwise they never would have joined the Ariba network. The next guest was a lady from the Thailand Siam City Cement Company – they use both S/4 HANA and Ariba. They are going for IOT linked to machine learning linked to predictive maintenance linked to re-ordering thigs via Ariba. The next guest was a lady from Fortescue Metals. She says Ariba is great, as well, but then you would, at an Ariba conference. That is a very cutting edge company, IT wise, as indeed are all the big mining companies in Australia. IBM Watson integrates with Ariba in a joint venture between the two companies. IBM want nothing less than to build digital brains which predict the future. At my organisation we are building something very similar, though nothing to do with procurement. The initial release (of the Ariba / IBM cognitive solution) has a very small scope compared to what they are aiming for long term. The speaker said that the more transparent the data is, the more pointless negotiations become. He thinks salesman will be on their way out in the next few years, buyers will be so empowered. I could not wait to get back to the office and tell this to our head of sales. He was not much impressed. The cognitive app concept (not a digital brain) will speed up the guided buying we saw earlier by making suggestions and using natural language. You can also photograph the think you are repairing, even if you do not know what it is, and the app will recognise it, and suggest who to buy another one from, based on the company rules. You can also do goods receipts on the app. I wonder how they give an incentive to the user to do a goods receipt in a timely manner? We can’t get people to do this! You can guess from the name this is an Australian electricity company. Hopefully you can guess, if you took one look at the name and thought it was a sausage company from Mexico, then you were wrong, shame on you. They (AUSGRID not the sausage company) went live with Ariba on 06/06/17. The speakers gets a “Toastmaster” award for a structured speech, usually an analogy comparing his project with the building of the largest cathedral in France (in the village of Aimes) as both projects had two huge problems that got solved. He said his project was so successful some people were even paying for things using Ariba rather than directly on their company cards, as the Ariba system was easier. Ausgrid is clearly an example of a successful privatisation of a government organisation. Their IT has progressed in leaps and bounds, and apparently a similar transformation has gone on all throughout the business. However the “we have always done it this way” brigade are very strong, and this is even more true in a government department, and he said there were dozens of “blockers” actively trying to stop the project, many from within the IT department, and the procurement department. In the end 91% of the project team had to be replaced (not sacked, they are on government conditions remember) but moved to other jobs and new people hired. This is a project team of about 57. They also brought in hundreds of end users to give them ownership. One huge irony is having all the spending going through the Ariba system means the existing rules are enforced by the system with hard errors, which means a lot of the lax behaviour in the manual system does not happen. What this means is that there is far more rigid enforcement of the rules in the private company than when it was a government department, the opposite of what you might expect. My constant pushing of Toastmasters is aiming for the day when all speakers at IT events are as good as the AUSGRID presenter was, rather than unstructured presentations where people read out slides and bore the audiences to death, and then the rotting corpses of the delegates cause a plague and the whole population of the city where the conference is hosted gets wiped out, often the population of the entire country. It makes you wonder why cities are so mad keen to host conferences in the first place. This was an example of fascinating content, it literally could not be more interesting, but a totally unstructured presentation, these two presenters need to get down to Toastmasters pronto, then the wonderful content could be combined with wonderful style. When I was on my Ariba project what I sorely missed was the “user exits” I was so used to inside SAP, where you could add custom fields to standard screens and add your own validations and so on. Ariba, being a cloud product, was not like that – although highly configurable, you cannot have your own user exits in a shared code base. The answer to this, and indeed for S/4 HANA in the cloud, is to have some publically available APIs. Then you create a program that runs outside the Ariba network and connects via the API to send or extract data to/from the Ariba system. The over-arching idea is that your custom applications can talk to any of the SAP cloud solutions – S/4 HANA, Ariba, Success Factors, Concur and so on, and make them work together, so in the end you have a sort of integrated ERP system, a radical idea I know, IBM once thought so, but you can simulate the idea of having all your business processes in one integrated system rather than having a separate system for procurement (Ariba) and sales (Hybris) and HR (Success Factors) and so on. One day a company is going to come up with the idea of having all these “modules” running inside the one system so you don’t need loads of interfaces. Hang on, that is a stupid idea, it will never happen. Going back to writing user exist for Ariba, your application can run in any of the cloud providers, or even in visual basic inside a spreadsheet, or – heaven forbid – inside an SAP system written in ABAP. Ariba has a developer portal where you can see all the APIs that are currently available. As can be imagined more are added over time, based on customer demand. You log on with your Ariba identity so they know which company you are from, then register (say you want to use a given API) and you are given a sort of developer key, so you can develop and test the application. When it is ready for prime time you get another key, so it can access your production data within Ariba. There are several flavours of API. An example of a flow extension is that you scan a product that arrives, read it’s bar code, and send the GR information into Ariba (the goods receipt event is part of the process flow). The most common user exit is a universal worklist that wants to approve things in Ariba as well as things like leave requests that live in another system. Another is an API to read all the data in a catalog that lives within Ariba. This implies you can load catalog data for a new supplier without having to upload a CSV file, which is what I had to do. In this day and age you really should not have to upload and download CSV files to your workstation all day long to move data between systems. You can have custom forms within Ariba, which I take to be the equivalent of custom fields, as some suppliers need more information than others when you are asking for a quotation. You can do your own “validations and enrichment” on the values in the fields in Ariba, the example given was adding GL codes, or checking the budget has not been exceeded. Hopefully this could make the integration with purchase orders generated from PM work orders work well, it was a stumbling block many years ago. You can use as many APIs as you want for no additional cost, this comes as part of the general Ariba licence fee. The presenter seemed to be using TABLEAU as the reporting front end; I have no idea if that is what Ariba uses, or just him. I bet SAP would prefer one of the Business Objects tools, or Lemuria. Apropos of nothing, it looks like the Australian National Broadband Network (NBN) uses Ariba. I should be wise to this trick by now, but the waiters and waitresses were walking around with trays serving us guests wine and food. After about half an hour there was a show in the middle of the floor where two women did gymnastics inside a hoop suspended in mid-air. When that show ended some of the waiters and waitresses were drafted into help clear away the hoop and two of them seemed to have a fight. Next thing I know, the waiters start doing cartwheels, the waitresses take off their waistcoats and shirts to reveal spangly tops and all of them go into a dance routine. One of the erstwhile waiters even came out as Michael Jackson wearing one glove and moonwalking. The raffle prizes were good as well, one lady won free entrance to the Ariba event in Las Vegas plus hotel accommodation, for her and her partner. There was a “demo theatre” in the exhibition area; it is always good to see things in action. The entry of service entry sheets is really painful in SAP – this is where the repair man or whatever has to list down what they actually did, which is often not known in advance apart from a generic “fix the widget machine” purchase order. The idea here is that the mechanic enters what they did into the Ariba network, and this gets approved by the customer and thus gets “flipped” into an actual invoice. This idea is wonderful, but it is all ruined because this facility is not part of the free “light” account that really small suppliers like one man mechanic companies are liable to have with Ariba. So it only works realistically with big companies that provide services. This was run by IBM and as a reward for going to this you got a pen, a battery for charging your phone, and lunch at an Italian restaurant (honestly), a set of steak knives, a cuddly toy, a set of wine glasses, a lifetimes supply of baked beans, an all expenses holiday for two to the Antarctic, oh didn’t he do well, didn’t he do well, oh Anthea! Anthea! This was a design thinking workshop where you and some fellow attendees had to brainstorm what it was that artificial intelligence and the cognitive “digital brains” could bring to the procurement table. One example was that an AI could scan all the news feeds and social media feeds – in dozens of different languages – to see if a company had got into trouble for using slave labour somewhere in its supply chain. Ariba quite rightly makes a big thing about using technology to try and stamp this out. A more prosaic example was using the unstructured data in contracts to try and see how many disputes each clause actually invoked in real life. One idea was that if a clause is never queried ever across dozens of companies and products, does it really need to be there, can it just be implicit, leading to less complicated contracts? This is all just blue sky stuff, of course. As mentioned earlier this was in some senses the main message of the conference. Some years back you could view the Ariba Network as like the European Union’s original purposes (trade). In the latter’s case the idea was it was a really good thing to have several countries which had no trade barriers between themselves. Given that, the more countries were in that block, the more benefit a new country got from joining that block. It was the same with Ariba – every company that joined the network not only benefited all the existing members, but also made the network that much more attractive to the next company who was considering joining. This is a so called virtuous circle, a geometric progression. It seems that Ariba has pretty much passed the tipping point here, and does not want to rest on its laurels and is now seeing what else it can bring to the table. One area is “direct” spend – in SAP terms the raw materials you buy using schedule agreements as opposed to the “indirect spend” which is items you buy using purchase orders. When I did my Ariba project, schedule agreements were not even handled by Ariba – they sent us a programmer to add the facility into Ariba. Times have moved on and Aria are investing an enormous amount of effort into enabling this – you need integration into SAP MRP and all sorts. However clearly the other area that mega billions of R&D dollars are being poured into is the “digital brain” area, as it applies to procurement. This came up again and again, non-stop. Already there are working prototypes, and literally the sky is the limit. I have blogged before on how the so called “S Curve” of technology advancement does not apply to AI, it will just keep increasing and increasing at an exponential rate till it hits the “singularity” and killer robots wipe out humanity. This was once again a series of different speakers re-iterating the main themes of the conference. Then there was an awards ceremony. Some of the awards were the usual business focused type of things e.g. most innovative company and the like. However another theme of the conference was “business with purpose” the idea being that you are not just in business to buy something for a dollar and sell it for two (to paraphrase Antony Hopkins in “Meet Joe Black”) but rather to make a billion dollars profit and use some of that money to change the world for the better. Wiping out child slavery in the supply chain was an often cited example of how technology can help here. Thus several companies got awards for helping the community in one way or the other e.g. Fortescue Metals one an award for having more women on the board than men, and for helping the aboriginal community by having lots of aboriginal suppliers. 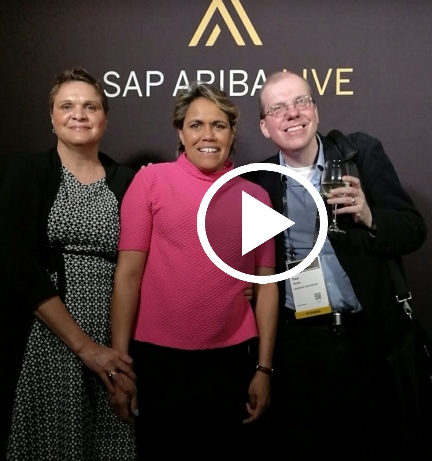 Lastly Olympic gold medal winner Cathy Freeman was interviewed by Ariba CEO Alex A. She then proceeded over to the party so attendees could have their photograph taken with her (see photograph of my wife and I at the top of this blog). What can I say? TWO parties at one event, one each night. In fact there were two different parties on the first night, I decided not to go to the second one as it went on till midnight and I had to get up the next day (to go the second day of the conference). It is a great idea ending the conference with a party, I understand sometimes this is not practical as people have to fly home, but often it is such an anti-climax when a really good event ends and people just drift away at random. In conclusion, this was a very good event, and I am sure it will only get bigger and better as the years roll on. It does occur to me that when it gets above a certain size it will not be in Sydney any more, in the same way SAPPHIRE used to be in Australia once, but no more. As I write this I am waiting for registration to the next SAP conference, the Australian SAP User Group conference (SAUG) to start, doors open in ten minutes. Naturally I will be writing a blog about that when it is over so stay tuned…. It was really a Nice Event. And you Were Also lucky that you got the pass for the Event.